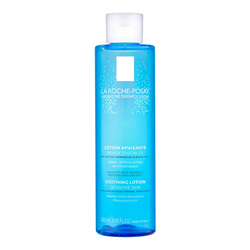 A cleansing milk that gently cleanses and removes make-up. Sensitive skin is perfectly cleansed of make-up, with respect for its physiological balance. Suitable for waterproof make-up removal. Non-comedogenic. 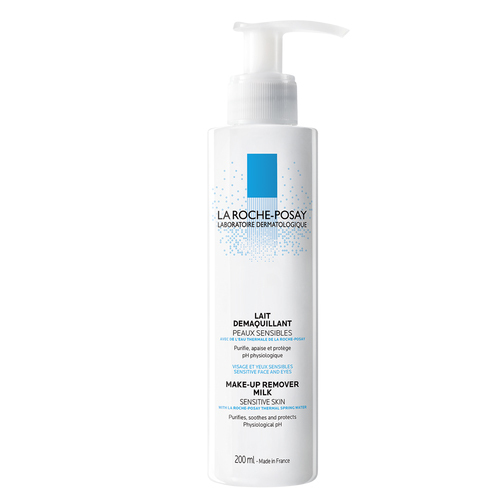 Physiological Formulation Charter: cleansing agents selected for optimal tolerance, high make-up removing power, moisturizing, soothing agents with La Roche Posay thermal spring water. physiological ph - soap-free - alcohol-free - dye-free - paraben-free - non-comedogenic. dry to very dry sensitive skin. Aqua, Ethylhexyl Palmitate, Isohexadecane, Paraffinum Liquidum, Glycerin, Ceteareth-25, Cetearyl Alcohol, Sodium Hydroxide, Poloxamer 184, Disodium Cocoamphodiacetate, Disodium EDTA, Polysorbate 80, Acrylamide / Sodium Acryloyldimethyltaurate Copolymer, Acrylates/C10-30 Alkyl Acrylate Crosspolymer, Sorbitan Oleate, Sodium Chloride, Sodium Diglycolate, Sodium Glycolate, Methylparaben, Myrtrimonium Bromide, Parfum (Fragrance). Pat onto the entire face with the fingertips or with a cotton ball. Rinse free.